Stevie wants to disappear and in twenty-seven days that’s exactly what she’s going to do, whether they like it or not. Sent to a treatment centre for eating disorders Stevie knows they’ve got it all wrong, she doesn’t need to be here, she doesn’t want to he and she’s going to get out of here one way or another. Abandoned by her best friend, her mother and not coping with the death of her brother, Stevie has no alternatives she’s going to get back to her brother. Haston’s novel is quite simply, brilliant. Seeing the world through the eyes of seventeen year old Stevie is heart breaking. I’m going to be honest and say that the novel is challenging to read, it deals with a lot of issues, grief, anger and living with an eating disorder. The anger that Stevie radiates is made easy to understand under the circumstances but all I wanted through the whole novel was to reach through the pages and comfort her. 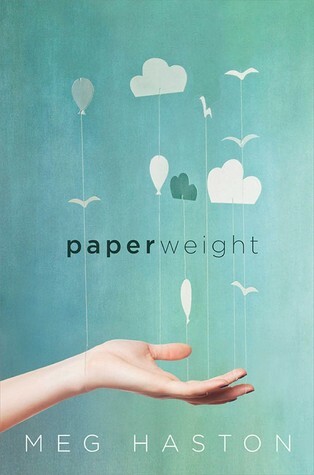 There are important lessons to be learnt while reading Paperweight. The story in no way glamourises eating disorders, it shows the reasons and the misery that they can bring and celebrates the girls around Stevie who are moving forward, even though she resents them. Haston has also made the girls normal and explores the different reasons why eating disorders develop, it has obviously been well researched. Like any novel of this nature it can be hard for people to read who have gone through eating disorders or problems with food. One of my favourite parts of the novel is the relationship between Stevie and her therapist, whom she calls Shrink. The therapist felt like a real person and I felt she was an honest character and represented what a good therapist should be, even if Stevie isn’t keen on opening up. Stevie’s relationships with others throughout the novel are also a real eye opener and although I’ve not had an eating disorder, as someone who has had depression I found her reactions to be realistic. The only negative that I have to say about the novel is that in the beginning I found it hard to keep track of who’s who as a lot of characters are introduced quite quickly. That said I think the novel is a good length and doesn’t dwell too much, it moves at a good pace but allows enough time for the reader to appreciate Stevie’s thoughts and feelings. I’m giving this novel 4 stars ****, a great new YA read. The character of Stevie is a little unapproachable at first but this story really picks up and teaches you about the range of people and emotions that are related to eating disorders. Finishing my first week of classes…yes really!